The Winter Newsletter has now been delivered to Society Members. It’s a bumper 16-page edition, and with it members should have received their Programme Cards with brief details of the year ahead. Most of our events are open to the general public, so if you already have your 2018 diaries you may wish to make a note of the dates now. It’s a special year for the High Wycombe Society which was formed 50 years ago, hence the rosette. 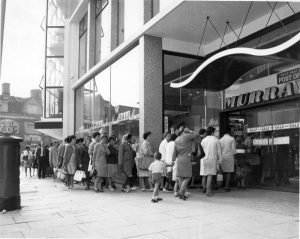 Shoppers queue to enter Murrays department store for a Sale. Photo Courtesy of Wycombe Museum. Shopping as it used to be – Join us on 17th January to find out more! Our 2018 Programme begins on 17th January with an afternoon talk at 2.30 p.m. at The Riverside (in St Mary St). Bucks Free Press Nostalgia columnist and Society member, Mike Dewey, will give a talk entitled “From Rations to Fashions – the High Wycombe Shopping Experience from 1945-1960”. Admission is free to all for this event. Afternoon meetings are a new venture for the Society so please help us to publicise the event. Take a break from the sales if you are in town and bring along family and friends to start the year with us. On 20th February there’ll be an opportunity to take part in a group visit to the Trenchard Museum at RAF Halton. On the evening of 23rd March at 7.30 p,m, we’ll be learning about local Women’s Suffrage pioneers and the Women’s Local Government Society’s “Suffrage to Citizenship” initiative courtesy of Willie Reid and Lesley Clarke. This meeting will also take place at our regular venue, The Riverside. The talk will be preceded by a short general meeting of the society to consider a couple of minor changes to our constitution. On 28th April we’ll be joining forces with the Bucks Archaeological Society who are celebrating their 170-year anniversary. 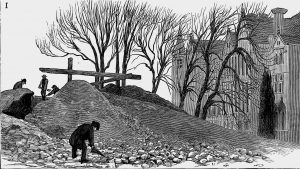 In an afternoon meeting at 2.30 p.m. at Trinity United Reformed Church on the London Road in High Wycombe, we will welcome guest speaker Leslie Webster, former Senior Keeper of the Anglos Saxon and Viking Collections in the British Museum to talk about “Buckinghamshire’s Saxon Prince: the Burial at Taplow”. This meeting is planned to coincide with the beginning of the Wycombe Arts Festival and will also be free admission for all. As in recent years, we have 3 planned Open days at Pann Mill – on 13th May, 8th July and 16th September. The millers will be hard at work, keeping the mill grinding and producing flour, while in the surrounding garden, various stalls will be set up selling a variety of things from bric-a-brac and books, to preserves and refreshments. Stars of the World War I heritage trail – High Wycombe Society members Sally Scagell and Malcolm Connell captured here at the official launch at Wycombe Museum. Hear more in June at our AGM. Our AGM on 8th June will share an evening with a virtual journey round High Wycombe in first World War. 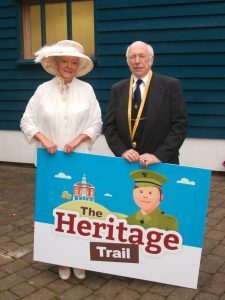 During 2017 several members of the High Wycombe Society contributed to a project which resulted in the Heritage Trail app. In the Summer, there’s a special occasion not to be missed. Sunday 5th August will be a daytime Golden Anniversary Celebration – please hold the date now! Further details and tickets will be available in the Spring. We hope to make this an occasion on which both members and non-members will celebrate their appreciation of the town. On 19th November we’ll be joining forces with Wycombe Wildlife Group to hear Guest Speaker, Ted Green MBE, founder of the Ancient Tree Forum. This will be at Wycombe Wildlife Group’s regular venue, the Trinity United Reformed Church opposite Pann Mill. And finally in December we also have a special treat in mind, but it’s too soon to tell you about that yet.